For this tutorial, you will find out how to microwave salmon using steam bags. 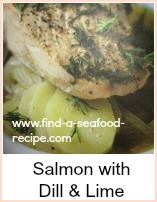 You simply add the salmon, seasonings of your choice, dash of wine or lemon juice, a pat of butter and away you go. 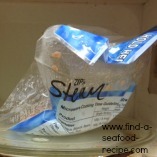 Make sure your sides are ready as the fish will take around 2 to 3 minutes! 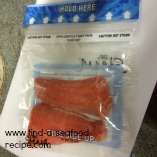 Take 2 fillets of fresh salmon. These weigh around 5 oz, 130 grams each. It's plenty big enough for one portion. A knob of herb butter on each either before or after cooking is all you need, but you could follow the instructions below. 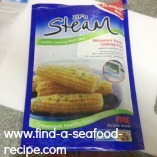 These are the steam bags I like to use. You could use other food bags, but make sure you read the labels and see that they are OK to use in the microwave. 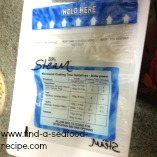 On the back of these bags, is a little chart giving you examples of cooking times. 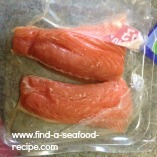 As you can see, a portion of fish this size takes 2 minutes from fresh and 4 from frozen. I am cooking 2 fillets and I am going to give them 3 minutes total. Put your salmon into the bag. 2 Tablespoons of lemon or lime juice or white wine with some fresh ground black pepper and a Teaspoon of dried dill and/or dried parsley. 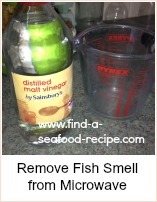 Pour this into the bag and give it a shake so the salmon is coated in it. You will see on the bag that there is a 'this side up' instruction - follow the advice! Put on a microwaveable plate and cook on high for 3 minutes. Leave to stand for 1 minute - be really careful as you open it as there will be steam. 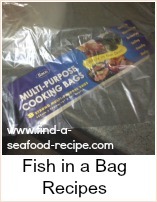 The bag will inflate and may 'sing' during cooking - this is perfectly normal, so don't worry. The instructions do say 4 minutes for 2 fillets, but I find they dry out and if you leave them in the bag for 1 minute, then they continue to cook. This is time for you to get your sides plated up ready to add the juicy salmon straight from the microwave bag. Get all the taste with less mess - how to microwave salmon.